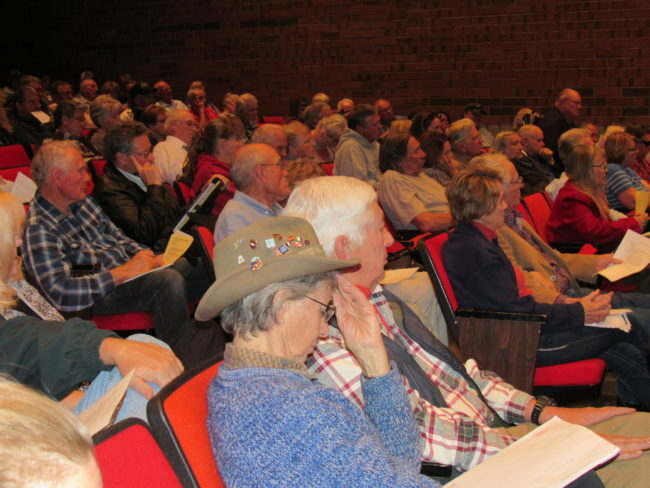 MANTI—Sanpete County commissioners tried last week to explain to a crowd that nearly filled the Manti High School auditorium why they are proposing a 60 percent hike in the county tax levy. But most of about two dozen people who testified at a public hearing last Thursday, Nov. 3 said the proposed increase was simply too much and the county should find some way to tighten its belt. Citizens tossed out ideas ranging from financing county government primarily with user fees, to a lottery, to selling rights to water that was supposed to be captured by the Narrows Project but now runs down the Colorado River. Commission Chairwoman Claudia Jarrett kicked off the hearing by giving some facts about property taxes and explaining the financial stringency the county is facing. She said the county has about 30,000 parcels in a variety of tax classifications. Many parcels are classified as “greenbelt” and taxed at a very low rate. The county has about a 90 percent collection rate on property taxes. Jarrett noted that the county levy accounts for about 21 percent of the typical home owner’s property tax bill. 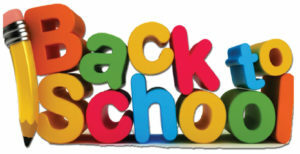 School districts get 64 percent. The rest goes to municipalities, water districts and other taxing entities. According to budget reports posted online by the Utah State Auditor, in the past three years, the total county budget has ranged from $13.6 to $14.6 million. In those same years, the county has collected about $5 to $6 million in property tax. The rest of the county’s revenue has come from licenses and permits, fines, charges from services, grants, and various forms of federal and state assistance. Jarrett noted that the last county tax increase was in 2004. 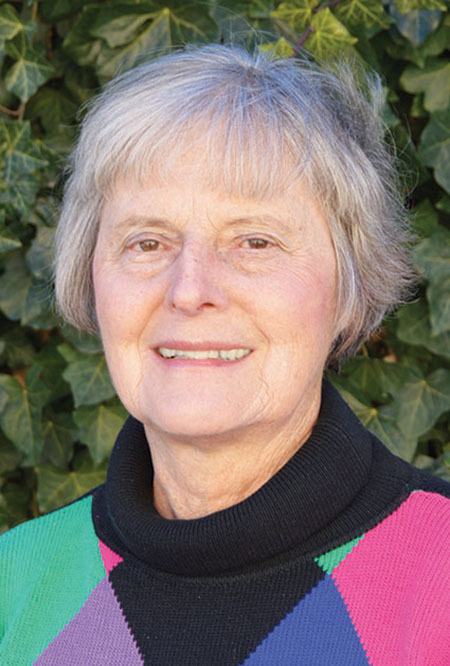 Over the years, she said, there has been a lot of discussion among commissioners about whether to increase taxes frequently, a little at a time, or hold off on any increases. County commissions have elected to hold off as long as possible. Jarrett said money coming in toward the end of one calendar year goes toward covering the budget for the next year. Often, by June or July, “it gets scary,” she said as revenue dwindles but the county still has expenses to meet through the remainder of the year. Often, the county can’t cover all of its expenses for the year with revenue coming in. When that happens, she explained, the county dips into reserves, which have dwindled to $2 million. Those reserves now need to be replenished. “A rainy day fund is important to have in this day and age” if the county wants to avoid bankruptcy, Jarrett said. She also talked about some of the fiscal problems the county faces that are beyond its control. Because of the Justice Reinvestment Act approved by the 2015 Legislature, the level of charges, and consequently, the sentences for drug possession have been reduced. That means more prisoners are being held in county jails rather than sent to state prisons. Recently, she said, the Sanpete County Jail has been nearly full with county inmates, meaning the jail hasn’t had room to house state inmates, for whom it receives state payments. Counties are required to pay for public defenders, expert witnesses, trial and appeal costs for indigent inmates. The ACLU has filed suit claiming the defense indigent inmates are receiving is inadequate. “It looks like more and more resources” will have to go to indigent defense, she said. More than half of the land in the county is federal land. The county receives $1.3 million from federal payments in lieu of taxes (PILT). “With the epic election we’re having, we’re very concerned bout what will happen to PILT,” she said. Meanwhile, the county participates in the Six County Association of Governments, which provides services in aging and nutrition, heat assistance, and critical needs assistance to individuals. The county also contributes to the Central Utah Counseling Center and Central Utah Health Department. Commissioner Scott Bartholomew noted that shortly after being appointed to the commission, he learned that a soda pop machine was being taken out of the courthouse because it used too much electricity. “That really puts it in perspective,” he said. Commissioner Steve Frischknecht said that during the recession in 2008 when tax revenue fell, commissioners decided to pay for their own gas and hotels when the traveled out of county for meetings or conferences. They have continued to do so. Several citizens who came to the microphone to comment said they didn’t want taxes increased to cover improvements at the county fairgrounds. Ron Ivory, mayor of Fountain Green, said he thought a plan to spent tax money on the fairgrounds had been “squelched” a couple of years ago. Frischknecht said he believes the county and fair board can raise the money they need without dipping into tax funds. About two years ago, Jarrett noted, the county considered partnering with Manti City and the South Sanpete School District on improvements in the northwest section of Manti, including improvements to the fairgrounds. But, she said, when some people expressed concern that county dollars might go to the other entities, the county dropped out of the partnership. Many of the other citizen comments centered on the need to hold the line on tax increases. Ray LaFollett of Mountainville said no business in the county has had a 60 percent increase in profits and no social security recipients had seen a 60 percent increase in benefits. Ted Meikle of Ephraim, who owns the largest hotel in the county, said he had “nothing but respect” for the commissioners and the effort they’ve made to avoid tax increases. “You’re throwing away a great legacy that you’ve worked for years to build,” he said. 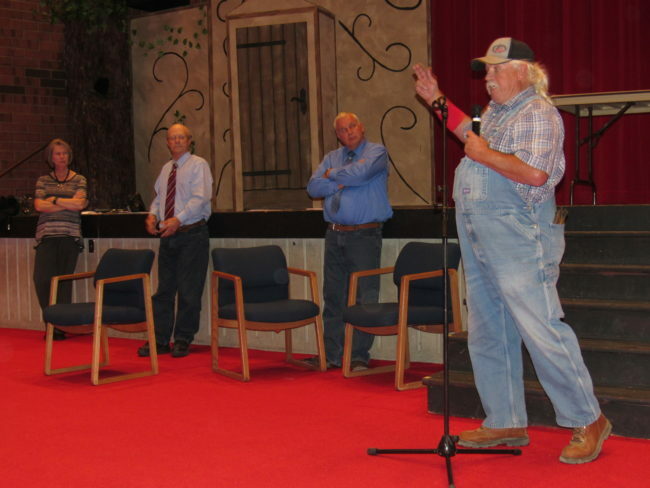 Larry Richards, who owns property in Holladay Oaks, a recreation subdivision near the Sanpete-Juab County line, said he represented owners of cabins and other second homes. Under state law, second homes are taxed on 100 percent of their value, while primary residences are taxed on 55 percent. “We’re putting a great deal of money into the county, and (we) receive zero,” he said. He claimed Holladay Oaks owners had called the Sheriff’s Office to report people hunting on land posted with “no trespassing” signs, but officers had not responded. Jeff McDonald, a former Mt. Pleasant city councilman, said when he was in office, he had no trouble identifying unnecessary expenses in the city budget. “If you think about the taxpayer, you can always find places to cut,” he said. Derek Overly of Gunnison, who owns Therapy West, a physical therapy practice, said government tends to outgrow the ability of people to pay for it. He said the county needed to look at services to see if they’re really critical and if they fit the proper role of government, and if not, eliminate them. Jarrett noted that there are a number of tax abatement programs to help veterans, seniors and others who can’t afford to pay taxes. She also said in order to adopt a budget by the end of the calendar year, the county needs to make a decision on the tax increase by about Dec. 1. Ephraim City Council members, the city staff, and hopefully, a few people in other towns in Sanpete County, are starting to utter the “B” word. Until you admit you have it, you can’t do anything about it. Ephraim and Sanpete County are 100 miles from the densely populated Wasatch Front. But we have blight just like bigger cities do. And we’re often more inclined than those big cities to try to hide our eyes and ignore it. So we commend the Ephraim City Council and city staff for acknowledging the blight that has been festering in the city for decades. We commend them for their strong stand that terrible looking properties that pose health and safety risks must be cleaned up. The council and staff are right to prioritize the trailer park at 200 North and 200 West, and the abandoned motel at 330 N. Main St. Those properties stand out as examples of the level of blight we cannot tolerate. Based on discussion in the last few council meetings, the trailer park is not fit for human occupancy. We understand the owner has drawn up the beginnings of a remediation plan. But we doubt the mess that currently exists can ever be transformed into a property that will be a credit to the city. Rather, we urge the city to close the trailer court and to relocate the residents. We believe such an action is in the best interests of the owner, the residents and the city. We acknowledge the need for the low-cost housing mobile homes provide. So we believe the optimum scenario would be for someone, ideally a private developer, but as a last resort the city itself, to buy the land and trailers, and clear the site. That accomplished, a private developer could develop a model mobile home park, the kind of park rarely found in rural Utah, with proper utilities, a road system and appropriately spaced units. Yes, it would be complicated. Yes, legal barriers would have to be surmounted. But it could be done. Ditto the old motel. Based on the report from Sunrise Engineering, the firm consulting with Ephraim City on code enforcement, the building has no marketable value. It cannot be transformed at any reasonable cost into a structure meeting current building codes. It needs to come down. The city has been “trying to get in contact” with and “negotiating” with at least two owners for at least 10 years. Enough. If the current owner does not clear the property fairly immediately, the city should move to condemn it. Common sense tells us the city would have no trouble getting a court to do that. 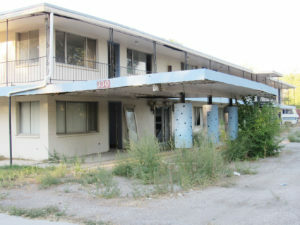 Once the motel is condemned, the city would have to bear the cost of demolishing it. Under an excellent policy approved by the Sanpete Landfill Cooperative Association, because removal of the motel is a beautification project, the city would be able to dump the refuse at no charge. The city could then put a lien on the land for the cost of demolition. The motel site has a lot of potential. It would take time, but we believe the city would come out okay financially. And the city would come way out ahead aesthetically. Once the trailer park and motel are taken care of, the Ephraim City Council has to set other priorities. Two other trailer parks need to be inspected. A couple of weeks ago, one of those parks was the site of a destructive fire. Because units in the park are too close together, a fire that started in one trailer quickly spread to the next home, destroyng both. After that, city officials say, they plan to turn their attention to Main Street. As the city manager has pointed out, Main Street is the “gateway” to Ephraim. Yet an informal Sanpete Messenger survey found that 10 percent of the properties on the street have problems, ranging from having stood vacant for 20 years to curb strips that have gone to weed. Tourists, potential Snow College faculty and business people considering investments get their first impressions of Ephraim, and often of Sanpete County as a whole, when they drive along Main Street for the first time. Those impressions could influence whether they do or don’t want to have a stake here. Thank heaven Ephraim officials are no longer hiding from the “B” word. We commend them. We support them. At the same time, we urge them to get some visible things done quickly. People have heard enough talk. They need to see change. Life is full of tough choices, including instances where you have to choose the lesser of two evils. But for me, the choice between Hillary Clinton and Donald Trump isn’t difficult at all. The Wall Street Journal, a traditionally conservative Republican publication, summed it up for me in their editorial endorsing Clinton. Let me say parenthetically that I respect Utahns who are voting for Evan McMullin. They may, in fact, deny Trump Utah’s six electoral votes, a laudable action. But it’s not for me. I voted for a third-party candidate once, and after the election had an unsatisfying feeling that I’d wasted my vote by casting it for someone who didn’t have a chance. But back to Donald Trump and why I believe he poses a danger to American democracy. First, there’s the rhetoric. He has mocked a disabled person, declared that we shouldn’t permit Muslims in the United States “until we figure out what’s going on,” described Mexican immigrants as drug dealers and racists and said John McCain isn’t a hero because he got captured and held as a prisoner in Vietnam. There was his declaration that he knows more about ISIS than the generals. He claimed Ted Cruz’s father had been with Lee Harvey Oswald shortly before Oswald shot JFK. Then there was his whole birther movement in which he claimed President Obama had not been born in the United States. And those are a tiny sample of the man’s outrageous statements. Trump has based his candidacy on the concept that he is an outsider, a successful businessman who can break through the Washington gridlock. Let me share something that isn’t really a secret. Trump is not a particularly successful businessman. In the early 1990s, he came within a sliver of being forced into personal bankruptcy. His companies have filed for bankruptcy four times. In the past 20 years, he hasn’t really owned most of the properties that bear his name. He’s sold his name itself, his brand, to other developers. He has claimed he is worth as much as $8 billion. But one biographer assessed his net worth at $150-$250 million. As he has done more than 4,000 times, Trump sued. Heaven help us if Trump wins the presidency and starts using such a methodology to denominate the federal budget or national debt. I have to say, I wasn’t particularly surprised when the Access Hollywood tape came out. People with narcissistic personality disorders believe they have a right to do whatever they want to do. They frequently get into trouble over sexual behavior. As for the women who have come forward to say Trump made unwanted advances, kissed or groped them, I believe them! I listened intently as Anderson Cooper of CNN interviewed a woman who had to be in her late 60s or 70s. She described in detail, detail so specific I’m convinced it was authentic, sitting next to Trump in an airplane. Suddenly, she said, without saying anything, he became an “octopus” and touched all parts of her body, including putting his hand up her skirt. She moved. Some argue that we must set character aside (something I will never do) and focus on public policy. As far as I’m concerned, Trump gets an “F” in that subject, too. The fact is, most of the time, he doesn’t know what he’s talking about. He says he’s going to build a wall between the United States and Mexico, a logistic impossibility. And, yes, he’s going to get Mexico to pay for it. He says he will repeal and replace Obamacare. But his comments after Obamacare premiums went up showed he has no idea how the program, flawed as it is, works. I wish I had time and space for more examples. Hillary Clinton is far from perfect. Her use of a private email server was a silly move and a big mistake. I suspect her motive was to be able to communicate candidly without the chance of her writings becoming public or possibly subject to Freedom-of-Information-Act inquiries. It didn’t quite work out the way she planned. But I balance that against her experience and accomplishments. She is a Yale-trained attorney who established herself as a leader as a very young woman. She was on the staff of the congressional inquiry into Watergate, worked as a children’s advocate and was a law professor in Arkansas. She was the first lady of Arkansas and the first lady of the United States. As a U.S. senator, she worked on legislation across the spectrum, including encouraging troop withdrawals from Iraq, raising pay and benefits for members of the Armed Forces, getting funding for redevelopment of parts of New York City destroyed by the 911 attacks, calling for an investigation of the federal government’s slow response to Hurricane Katrina, and getting funding to bring broadband to rural areas. That’s a small sample. In fact, I believe Hillary Clinton’s life embodies the Methodist slogan she pronounced in her acceptance speech at the Democratic National Convention: “Do all the good you can, for all the people you can, in all the ways you can, as long as ever you can.” What a different value system from what we’ve seen and heard from Donald Trump. In this most exceptional of elections, that’s good enough for me. Monte Bona of Mt. 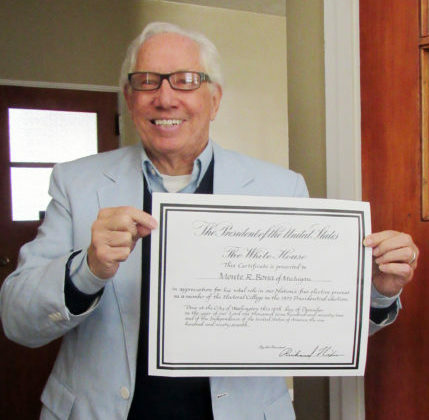 Pleasant holds a certificate signed by President Richard Nixon recognizing him as a member of the Electoral College in 1972. Bona, 79, says citizens concerned about the state of electoral politics in 2016 should look through the lens of history. MANTI—The Sanpete County Commission has scheduled a public hearing for next Thursday, Nov. 3 on a proposal to raise county property taxes for the first time since 2004. The hearing will be at 6 p.m. in the east courtroom of the Sanpete County Courthouse. The commission is proposing to raise the county tax rate 60 percent beginning in 2017. According to a Truth-in-Taxation notice published in this week’s Messenger (see the Election Section), applying the new rate would result in the county getting 56 percent more tax revenue in 2017 than it expects to receive in 2016. The Truth-in-Taxation notice says the tax increase, if adopted, would raise taxes about $112 on a $150,000 home. The county tax on such a home would go from $201 this year to $314 in 2017. According to the notice, the county levy on a $150,000 business would go up $205, from $356 this year to $571 in 2017. The increase would apply only to the Sanpete County levy. The county is just one line item on the property tax bill. Property owners also pay taxes for school districts, municipalities and water districts, among other taxing entities. Moreover, while property taxes are the largest revenue source, they account for less than half of the county budget. The county also relies on federal funds, including “payments in lieu of taxes” (PILT), road money from the state, grants, and fines and forfeitures, to name a few sources. While school districts and municipalities have raised taxes and fees, Sanpete County has held the line for years, Roth says. To do so, it has had to pull $2.5 million out of its reserves. And she projects the county will need to dip into savings another $440,000 by the end of 2016 in order to have cash to balance the final, adjusted 2016 budget. “Our reserves are now at a critical low, and the ability to cover ongoing expenses, as well as unexpected expenses, must be addressed,” says a letter from county commissioners accompanying the Truth-in-Taxation notice. The county is grappling with a number of things over which it has no control. Congress has not approved PILT funding, which brings in about $1.3 million. However, congressional representatives have promised that PILT will be renewed and the county will get its PILT check, even though the check is late. But representatives have said Secure Rural Schools (SRS), another federal program that assists counties that have a lot of federal land, is gone. Up to now, the program has provided about $700,000. Sanpete County, like other counties in Utah, faces what Roth calls an “unfunded mandate” growing out of passage of the Justice Reinvestment Initiative. The measure was passed by the 2015 Legislature. One goal of the act was to reduce the number of people going to prison for drug offenses, since drug addiction is widely acknowledge to be a disease. The act reduced what used to be felony charges for drug possession to misdemeanors. The result is that more people convicted of drug charges are serving their sentences in the Sanpete County Jail, with the county footing the bill. Fewer people are going to prisons, which means the county, which has a contract to house state inmates, is getting fewer state inmates and consequently, getting less money from the Utah Department of Corrections. Another big area of cost growth is human services. The county provides money to the Six County Association of Governments, which administers economic development, housing and emergency assistance programs. Sanpete County also supports, and county residents receive services from, the Central Utah Health Department and Central Utah Counseling Center. All of the charges from those agencies have gone up, Roth says. But the county believes the services “are vital to the well being of our citizens,” She says those expenses will take a big piece of any extra money coming from a tax increase. 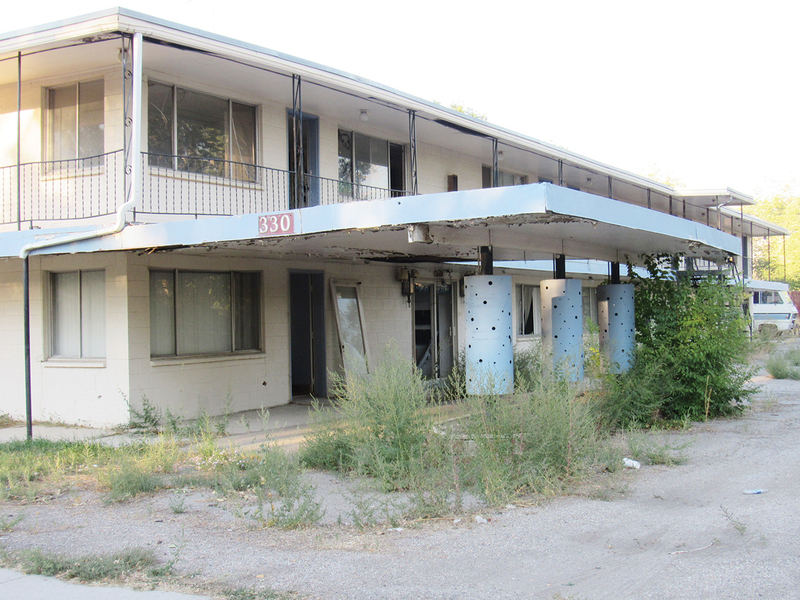 EPHRAIM—The Ephraim City Council made it clear last week that it wants action, not just talk, regarding two target properties riddled with what inspectors said were serious code violations. Mark Huntsman, senior vice president of Sunrise Engineering of Fillmore, and Jody Hilton, an inspector for Sunrise, reported to the council on Wednesday, Oct. 5 on inspections they conducted at a 2-acre trailer court at 200 North and 200 West and the long-vacant Travel Inn at 300 N. Main Street. Ephraim City recently signed a contract under which Sunrise is providing building inspection services and assisting with code enforcement. 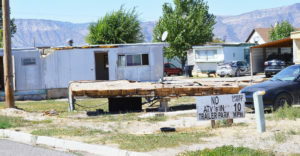 Ephraim Police Chief Ron Rasmussen said city action on the trailer park and motel are just the beginning of a code enforcement effort city-wide. “We’re going to clean up the whole town,” he said. The Sunrise inspections on Sept. 20 culminated in a 20-page letter of findings regarding the trailer park and a one-page letter about the motel. Perhaps the most serious concern at the trailer park was what inspectors told the council was an “eminent danger” of contamination of the water system. Rather than pipes, many of the trailers receive water through hoses, and lots of the hoses leak. The sewer system does consist of pipes, but the pipes are close to the leaking hoses. If a sewer pipe sprung a leak, the effluent could drip onto the hoses and get though the holes into the water supply, city staff say. Or contamination could occur within a single unit. Since none of the units have backflow devices to prevent water from one unit from flowing into the general water system, such an incident “would affect the whole community,” Hilton told the council. Another concern is fire danger. The building code says a mobile home must have a mobile-home-approved furnace and water heater. Since Sunrise inspectors looked at the exterior of the 200 North complex only, there is no assurance the approximately 20 trailers at the property comply, Huntsman said. He added that he noticed lumber as one of the components of a roof of at least one unit. “There’s definitely a fire danger there,” he said. Noting that fires in mobile home parks are often deadly, the inspectors recommended that the city fire marshal conduct an inspection within 14 days, including verifying if the city has sufficient fire hydrants close to the park to fight a fire there. After hearing the Sunrise report, the council passed a motion directing David Strate, the property owner, to present a plan within seven business days to remediate water, sewer and electrical problems on the site. In discussion, council members mentioned giving Strate somewhere between six and nine months to do the work outlined in the plan. Beyond coming up with a plan for major utility repairs, the motion said Strate needed to demonstrate his intent to cooperate with the city by getting certain things done within 14 days. That immediate list included removing RVs (under zoning, only mobile homes, not RVs are permitted), removing abandoned trailers, getting junk and unlicensed vehicles off the site, capping a sewer line coming out of one trailer that isn’t connected to anything, fixing a propane tank so it serves just one trailer and is no longer hooked up to two RVs that aren’t using it, and clearing trash from the property. The motion said Strate also needed to give the city a roster of trailers and who owns each one so the city can work with owners of trailers not owned by Strate himself. Regarding the motel, Hilton reported finding severe structural cracks and roof damage. “It appeared to be cost prohibitive to convert (it) to student housing or another use,” he said. Brant Hanson, city manager, said the city is in regular contact with the current owner. Based on a recent contact, he said, the owner might be willing to demolish the building, which would save the city the cost and trouble of condemning it and demolishing it. Based on that report from Hanson, the council took no action on the motel. 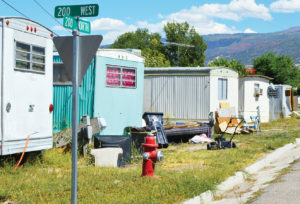 EPHRAIM—The Ephraim City Council, taking perhaps its strongest stand ever on enforcement of city building and utility codes, voted last week to give the owner of a mobile home park at about 200 West and 200 North a final, 30-day notice to correct health and safety hazards. If the owner, David Strait, doesn’t fix things the city has been warning him about for as long as 15 years, the council called for shutting the park down, even if it displaces residents of about 20 trailers. Much of the meeting was devoted to a police officer, the public works director, the power superintendent, the city planner and neighbors describing conditions that have to be classed as shocking. Officer Len Gasser, the city’s main code enforcement officer. said he got a complaint last June saying someone was living in a trailer without power, water or sewer. The residents, he found, were relieving themselves in 5-gallon buckets, emptying the buckets into a larger bucket outside, allowing the larger bucket to dry up and then emptying the human waste into their garbage can. Gasser gave Strait, who was renting the unit, three days to install a flush toilet system. When Strait failed to comply, Gasser issued him a citation for a code violation. A week or two after investigating the complaint about the home without water, power or sewage disposal, Gasser; Chad Parry, director of public works; and Corry Daniels, city power superintendent, met Strait, the property owner, on site and walked through the whole park, trailer by trailer. Parry reported one water line and one meter served the whole park. As for the lines between the main water line and individual trailers—those were garden hoses. Naturally, none of the hose had backflow devices. Worse, he said, sewer lines were positioned above the water hoses, and almost every sewer line was leaking, creating a significant risk of sewage dripping into water lines. “If it was my choice, if I had the right credentials, I would shut the water off,” Parry told the council. The electrical system in the park was a little like the water system, Daniels, the electrical superintendent, said. While some trailers had their own connections, in other parts of the park, a single connection was serving several trailers. People had run extension cords from trailer to trailer, or between trailers and the meter box. They were essentially powering their homes off extension cords. Some of the trailers had gone vacant or even been partly torn down, but power had not been shut off, Daniels reported. He said he pulled meters out of four trailers, shutting off the power. “I just felt it was a health concern,” he said. One resident told Daniels there had been a fire in one of the units on the south side of the park, the area several officials described as most deteriorated and most dangerous. Officer Gasser said recently, he and Ephraim Police Chief Ron Rasmussen served a warrant at the same trailer that they had investigated earlier for operating without water, sewer or power. They recovered 4 grams of methamphetamine, 100 needles and carried out four garbage bags full of drug paraphernalia. A housing unit where that much meth has been present should be condemned, Hanson, the city manager commented. But up to now, there’s been nothing to prevent Strait, the owner, from rerenting it. And, Hanson said, he charges $500 per month. Another neighbor, Heather Howard, said her family has owned a house that faces toward the south side of the park for 22 years and has made a lot of improvements to their property. All of the city workers described repeated efforts to work with the owner to correct code violations. But all said Strait had demonstrated no serious intent to turn around the development. I couldn’t possibly, in the space available, cite all the examples I’ve gathered of statements by Donald Trump that I find to be simplistic, mean, crass and dangerous. There are many reasons why Donald Trump must never become president of the United States, such as his repeated business bankruptcies, unprincipled business practices, and the fact that over the past 10 years, his political statements have been all over the map. But I believe his rhetoric alone is reason to reject him. I believe America can be, and at its core is, a civil, respectful society committed to democratic ideals. The president of the United States must model those values. Trump does not. When it comes to women, Trump gets downright nasty and vulgar. After Megyn Kelly, an attorney and accomplished journalist for Fox News, a Republican-oriented, conservative network, asked Trump some perfectly legitimate questions, such as “When did you become a Republican?”, Trump attacked her. And after some intemperate statements at a rally, Trump, knowing the press would report what he had said (as it has a responsibility to do), attacked the whole press gallery. One attack that astonished me was against someone who isn’t even a Trump adversary. Sen. John McCain is serving his fourth term in the U.S. Senate and was a Republican candidate for president, the post to which Trump aspires. Everybody knows that McCain spent five years as a POW in the Hanoi Hilton, where he was starved and tortured. When he returned to the United States after the war, he could barely walk with crutches. In America, we respect people’s right to protest. Every politician deals with hecklers, and typically, police or security offices ask them to be quiet or leave. Then there’s the litany of statements that, at their core, have to be regarded as racist. Trump has made statements in years past that demonstrated he was well aware of David Duke, the one-time grand master of the Ku Klux Klan, who has tried to get nominated for president in both the Democratic and Republican parties. Journalist Jake Tapper of CNN asked Trump whether he would disavow Duke and other white supremacist groups. “Just so you understand, I don’t know anything about David Duke, OK,” Trump responded. A few days later, after the South Carolina primary, CNN reported a poll had showed 25 percent of South Carolina residents who voted for Trump believed slavery never should have been abolished. I have to wonder if there was a connection between that sentiment and Trump’s response to the Duke endorsement. Then there are Trump’s simplistic statements about policies. He implies he can solve vexing national problems virtually with a wave of his hand. Michael Leavitt, who spent decades in public service as Utah governor and secretary of health and human services, summed up the problem with such declarations. What dumfounds me is how Trump is gathering such a huge national following. On a CNN program last Sunday, Carl Bernstein of Woodward-and-Bernstein fame called the Trump phenomenon a cross between celebrity culture and neo-fascism. A professor who did a study of Trump supporters found many believe in an authoritarian approach in other areas of life, such as child rearing. Sadly, the most qualified candidate on the Republican stage is John Kasich. He has served in leadership roles in Congress and been a successful governor of a large industrial state. He is the most substantive of any of the candidates on policy and the most measured in rhetoric. No wonder he’s been endorsed by both the New York Times and Washington Post, organizations that, if I may say so, have a much closer view of what’s going on than you and I. Yet at the time of this writing, he was barely still in the race. In summary, Donald Trump does not speak for me, and I don’t believe he speaks for most people in our county. I hope Sanpete Republicans will send that message when they vote in the Republican presidential preference caucuses on March 22. And no group of people is a better example of that statement by Calvin Coolidge than citizens of Sanpete County, as represented by the Sanpete Water Conservancy District (SWDC). In order to get the Narrows dam and reservoir constructed, Sanpete leaders have been meeting with officials, writing letters, conducting studies, signing agreements, defending a lawsuit, and paying taxes to pay for all those things, since 1933. In civil society, when a business or government organization approves a project, or law or proposition, or says it will approve it, that means it’s a approved or will be approved. There might be a wrinkle or two between approval and implementation, but the approval still stands. In 1966, the Army Corp released a report, with comments from other federal agencies, favoring the Narrows. In 1995, after completing an environmental impact statement (EIS), the Bureau of Reclamation (BOR), the lead federal agency for water projects, issued a “record of decision” approving the project. That’s when Carbon County interests went to court to stop the project. They claimed the EIS was deficient. That’s where the train stopped. Mind you, the BOR had approved the project. A rational person would assume that the approval still stood, or if approval was contingent on correcting the alleged deficiencies in the EIS, and the BOR had done that, the BOR would issue another record of decision. Furthermore, one would assume that if the Army Corp had, in essence, given a high-five to the Narrows, as soon as the revised EIS was out, or, if needed, as soon as the BOR issued another record of decision, the Corp would have signed off on the project. Since then, the BOR has produced a third EIS (more than 200 pages) and issued a second record of decision. Now the Army Corp is claiming Sanpete County has never made the case that the project is needed. Well, we’ve been making that case that water storage is needed for agriculture, industry and culinary use since 1933. Time and again, federal and state agencies have agreed that the need exists. But yes, we’ll explain it all again for the Corp. The Army Corp claims Sanpete County hasn’t presented sufficient alternatives to building the Narrows. Again, about nine years ago, Sanpete and Carbon County interests cooperated in funding an independent, unbiased study of alternatives to the Narrows. CH2MHill, a nationally known engineering firm, looked at 15 alternatives. It issued a 70-page study, which concluded that the Narrows project, as proposed, was the most cost-effective and environmentally friendly way to deliver 5,400 acre feet of water per year to Sanpete County. (Our rights to that water have been acknowledged again and again in signed agreements and by the courts.) Yes, we will get the ideas and information from the CH2MHill study to the Corp. Finally, the Army Corp says the SWDC needs to do a supplemental EIS. That’ll be the fourth EIS on the project, not counting the 520-pages recently submitted to the Corp. But we’ll do it. The branch director for the Army Corp of Engineers and a lead scientist in the Denver regional office of the U.S. Environmental Protection Agency told Sanpete leaders in late July they are not trying to kill the Narrows and that they aren’t, per se, against new dams being built. We’ll take them at their word. In the face of difficulty, Coolidge said, “Persistence and determination alone are omnipotent.” In that vein, Sanpete County will persist until the Narrows is finally, finally, approved and built. EPHRAIM—The Ephraim City Council has approved a contract under which the city will pay $5,000 per month to a Washington, D.C. firm for lobbying and grant writing. At a meeting in late July, the council approved the contract with the Ferguson Group, a lobbying firm that has been in business 30 years and specializes in “securing policy and regulatory changes, federal funding (and) grants” for local governments. Brant Hanson, city manager, said the Ferguson Group already helped the city and the Ephraim Irrigation Co. get $1 million to fix the Ephraim Tunnel. And Hanson said he believes the Ferguson Group can help Ephraim get many other grants it wouldn’t get otherwise because the firm can write proposals that city staff don’t have time or expertise to prepare as well as make direct contacts with funding agencies once the proposals are submitted. The contract stipulates that beside the $5,000 retainer, the city will pay some “expenses” for the firm. City Manager Brant Hanson said only expense would be for the lobbying firm staff person assigned to Ephraim to make one visit to the city. Sending a representative to Ephraim gives the Ferguson Group “a chance to get a feel for our town and really present that as they advocate for us,” Mayor Richard Squire told the council. “So do we have a goal in mind of what we’re looking for from these guys?” Councilman Todd Alder asked in the council meeting. Hanson said the staff was putting together a list of projects for which the city hopes to get federal grants. At the top of the list is $2 million from the Army Corps of Engineers for a new municipal water well. The Ferguson Group is already working on that. The Ferguson Group also helped Ephraim prepare a proposal to the U.S. Federal Emergency Management Agency for $100,000 under what is known as the SAFER program. (The acronym stands for Staffing for Adequate Fire and Emergency Response). If approved, the grant would help Ephraim bring on a paid, full-time fire chief. No matching funds are required under the SAFER program. In the future, the city hopes to get help from the Ferguson Group to apply for more funding from FEMA for fire equipment. Later this year, Hanson said, the city might look into a grant from the U.S. Justice Department under the Community Oriented Policing Services (COPS) program. The plan is to apply for $105,000 to $110,000 in federal funds, and put up about $200,000 in city funds, which would enable the city to bring on one additional police officer and pay his salary for three years. The COPS program has been in operating since 1994. Since then, according to a report, the program has made grants totaling $14 billion to put 125,000 officers on the street in 13,000 police departments, large and small. Council members also wanted to know if the Ferguson Group might be able to help find finds for restoration of the Hansen House, a city-owned museum house in Pioneer Park; and the Bishop’s Storehouse, the Ephraim Co-op and the Granary Arts Center buildings, all near Main Street and College Avenue. Both structures are 100 percent city-owned, Hanson said. In contrast, the Church of Jesus Christ of Latter-day Saints has an ownership interest in the Co-op and Granary Arts buildings. “We own them, but it’s not clean title,” Hanson said. He recommended against spending any money on the two historic buildings until the city can get 100 percent clear title. Councilman Alma Lund said he had talked with people connected with the church. “It’s looking pretty positive that the church will relinquish their interest,” he said. But, he said, church has a long process for making and implementing such decisions. Later in the meeting, Chad Parry, public works director, said water consumption combined with continuing drought are “really putting pressure” on the city water supply. Most of the time, water from mountain streams that runs into water tanks on the east bench takes care of the city’s needs. But in the summer, when people are watering lawns, the city sometimes has to draw on a municipal well in the west central part of town. “We’ve had to run the well,” Parry said. “This is the earliest I remember we’ve had to use the well for backup.” And he said the water table the well draws from has dropped. Parry said if the pattern continues next year, Ephraim might have to impose watering restrictions. BOUNTIFUL—The U.S. Army Corps of Engineers has thrown a stumbling block in the path of the Narrows Project that could take as much as $2 million and as long as two years to surmount. First, the number of alternatives the SWCD has presented to building the Narrows is not sufficient. Third, the SWCD needs to present a supplemental environmental impact statement (EIS). Such a document would be at least the third environmental study completed in the past 10 years. Collectively, the studies are more than 2,000 pages. But Sanpete officials felt a bit better, Soter says, after meeting face to face on July 27 with Jason Gipson, chief of the Utah-Nevada branch for the Army Corps, and Julia McCarthy, a stream biologist for the U.S. Environmental Protection Agency in Denver. The meeting was at the Corps of Engineers’ office in Bountiful. The Army Corps response “isn’t a deal-killer for the Narrows,” says Edwin Sunderland of Chester, SWDC chairman. 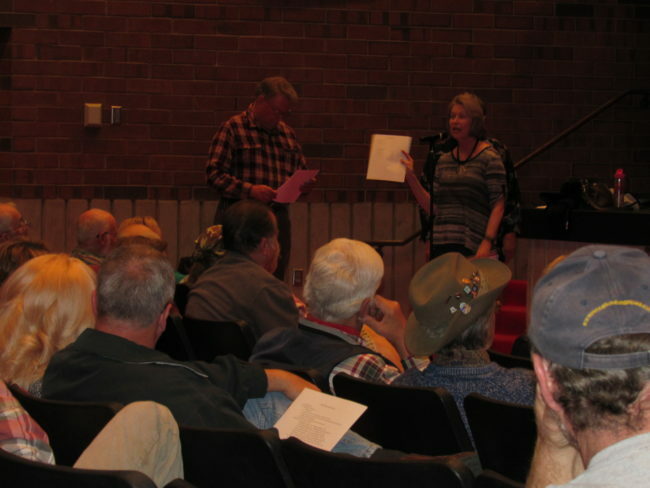 The Sanpete representatives asked the federal officials point blank if their intent was to kill the project permanently. Gipson and McCarthy “insisted that such was absolutely not their intent, and that they did not believe that dams should no longer be built,” Soter, who was in the meeting, reported. But the federal officials wouldn’t relent on their request for a costly supplemental EIS, says Steve Frischknecht, Sanpete County commission, who was also in the meeting. “It’s easy to get angry over situations like this, and at first, we were furious,” Sunderland said. “But anger seldom solves problems, so we’ll just knuckle down and do what we’ve always done: Push ahead. Sanpete County has been trying for 80 years to get a dam and reservoir built to store supplemental water for use in the summer after stream flows decline. The Narrows Project would serve the same function for the northern county that the Gunnison Reservoir serves for the central county and the Gunnison Valley. A court ruled that 5,400 acre feet of water that falls on the eastern slope of the Wasatch Plateau but inside the Sanpete County line belongs to Sanpete. For decades, county and conservancy district officials have said the Narrows Project is the only practical way to capture the water and deliver it to North Sanpete farmers and communities. The present plan calls for a 120-foot dam and a 600-acre reservoir in the Manti-LaSal National Forest near the top of Fairview Canyon. The Forest Service has approved use of the land. Multiple EIS’s were prepared before 2000. County leaders turned up the heat on the project again in the mid 2000s. In 2013, the U.S. Bureau of Reclamation (BOR), the lead federal agency on dams, prepared a final EIS, and then issued a “record of decision” approving the project. The decision gave Sanpete 15 years to design, finance and build the project. That left one final approval, the 404 permit from the Army Corps. The SWDC contracted with a Logan consulting firm, which prepared a 520-page application. The document, Soter says, addressed every aspect of the Narrows Project in detail. Between receipt of the May letter from the Corps and the meeting July 27, Sanpete leaders conferred with U.S. Rep. Mia Love., U.S. Sens. Orrin Hatch and Mike Lee, and Gov. Gary Herbert.